So as knitters and designers in the yarn world we all know that blocking is the best thing that can happen to an already amazing piece of knit or crocheted goodness. Blocking smooths out stitches, evens up edges, and can open up lace from a fuzzy lump into something breathtaking. But in order to block it really helps to have the right tools. When I first started blocking I started with tried and true tool - t-pins. Make sure you get the rust-proof ones, but just to give you a warning, sometimes after a long time in circulation even those can rust - so be careful! Pins are perfect for bringing out points, but not quite as useful for straight edges. Enter the wires. Wires are amazing for straight edges. They even have special wires that have flexibility so you can pin them into curves. But for a cheaper line option - straight or curved - you can use cotton yarn or string and pins. You can use any yarn for this purpose, but cotton yarn is really helpful in this case because it doesn't break as easily under pressure. 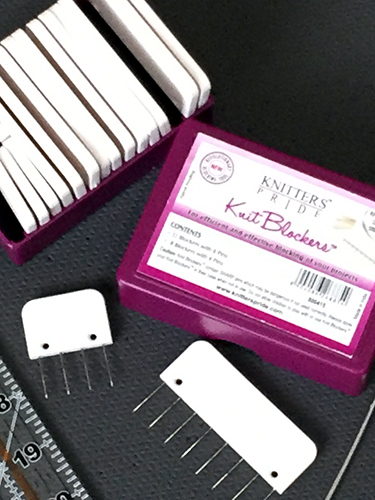 Finally I came across these Knitter's Pride Blockers. I adore these things. For swatches they cannot be beat. They are so fast and you can make straight (or even pointed edges) so easily. For sweater pieces you can swiftly block your pieces to schematic - it's amazing to me how much faster these are than any other method. 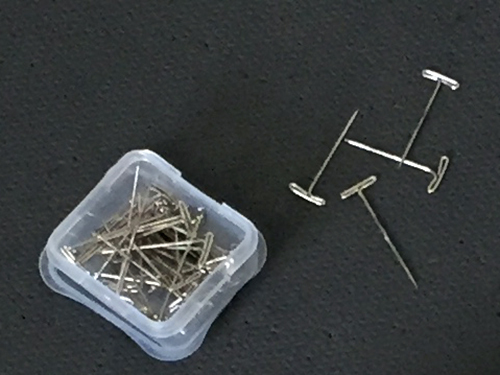 The set comes with large and small blockers that have rows of pins. They don't always work with complex lace, but I can always go back to pins for those. Now I just need a few more sets of these so I can block an entire sweater at once using only these wonderful tools. So the other important tools in my arsenal are blocking mats - I basically can cover my whole studio floor in blocking mats. I also love having my huge quilters ruler to help me quickly block sweaters or pieces to schematic measurements. What are you go-to blocking tools and tips?